ImageViewer is an open source project written in WPF and C# that allows users to view images and manipulate them. 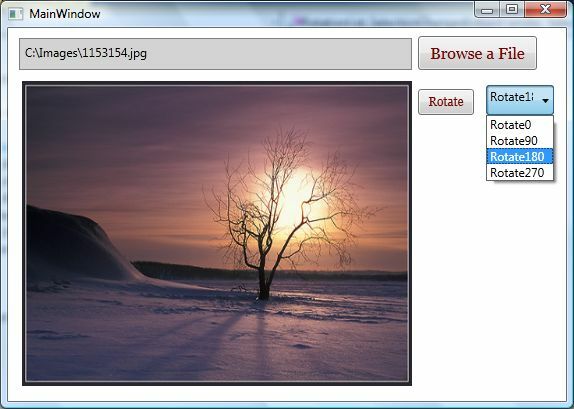 The ImageViewer project is an open source project written using WPF, XAML, and C#. This project allows users to view and manipulate images including extensions .bmp, .gif, .ico, .jpg, .png, .wdp, and .tiff. The application looks like the following and supports viewing and rotation at this time. I am adding more features to this project and will be uploading new features soon. If you plan to work on this project, let me know and we can share the functionality. The Image class is used to load and view an image in WPF. This class displays .bmp, .gif, .ico, .jpg, .png, .wdp, and .tiff files. If a file is a multiframe image, only the first frame is displayed. The frame animation is not supported by this class. In the above code snippet, UriKind let you set if the image is relative to the application path or has an absolute path. Clicking on the Browse button lets you browse the files and the selected file is displayed in the Viewer. The Rotate button rotates an image based on the rotate drop down selection. It has Rotate0, Rotate90, Rotate180, and Rotate270 options. The Rotate button click event handler code is listed below. This article showed how to use the Image control of WPF to load and view the image files. I will be working with this Image Viewer for a while and will build a full-fledged image viewer.